You've had a cold for five to seven days and thought you were getting better. Then it grew worse. More congestion, increasing fatigue and now headache or facial pain around your nose or eyes or upper teeth. You guessed it was a sinus infection. But is this what you need to get better? Chances are, it is not. Most cases of acute sinusitis are caused by viruses, not bacteria, and taking an antibiotic does nothing more than enrich the pharmaceutical companies and increase the chances of being infected with drug-resistant bacteria. The average adult catches two or three colds a year, and 0.5 to 2 percent of them are complicated by bacterial infections. In other words, if antibiotics are prescribed for most sinusitis cases, they are most likely being way overprescribed. In the course of a year, an estimated 37 million Americans experience sinusitis, the fifth most common diagnosis for which antibiotics are prescribed in outpatient settings. But how is the doctor to know whether an antibiotic is what is needed? Unless a sample of the pus in the nasal cavities is examined under a microscope - a rare act in most physicians' offices - there is no certain way to tell. Doctors are advised to use antibiotics to treat sinusitis when at least three of four signs are present: purulent (yellowish or greenish) nasal discharge predominantly on one side, local facial pain mainly on one side, purulent nasal discharge on both sides or pus in the nasal cavity. Many physicians as well as patients take purulent nasal discharge lasting seven or more days as the primary indication of a bacterial sinus infection. Yet, study after careful study has shown no reliable benefit of antibiotics when doctors try to apply this or any of the other criteria in deciding on drug treatment. In the latest study, published last month in The Journal of Family Practice, no significant benefit over a placebo was found from using the antibiotic amoxicillin among 135 patients with typical indications of a sinus infection. All the patients complained of sinusitis, with pus in the nasal cavity, facial pressure or nasal discharge lasting longer than seven days. A small subgroup of patients receiving the antibiotic became better faster than the others. But the researchers were unable to discern anything about those patients in advance of treatment that indicated a bacterial infection, as opposed to a viral one. That does not mean that antibiotics are useless in treating sinusitis. But it does mean more research is needed to help doctors determine who is most likely to benefit from the costly and potentially harmful drugs. Many people who do not seek medical care for an apparent sinus infections try to treat the problem on their own, typically buying one or more over-the-counter "sinus remedies." Many millions of dollars are spent on such "remedies," none of them getting at the cause of the problem. 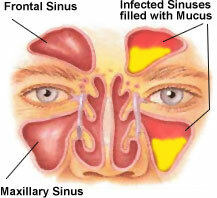 Sinusitis is simply an inflammation of the lining of the sinus cavities. There are four pairs of sinuses, which are spaces normally filled with air in the front of the skull: over the eyes in the brow area; inside each cheekbone; just behind the bridge of the nose and between the eyes; and in the upper region of the nose and behind the eyes. The membranes that line the sinus cavities are moistened by thin mucus. Sinus inflammation has many causes, including infection by viruses, bacteria or fungi; an allergic reaction to a food or environmental substance; or the response to an inhaled irritant like tobacco smoke or outdoor or indoor air pollution. Each sinus cavity has an opening into the nose to allow a free exchange of air and mucus. But if something causes swelling within the nose, air can be trapped inside a sinus cavity, along with pus and other secretions, causing increased pressure on the wall of the sinus. Or the congestion can create a vacuum in a sinus cavity. Either causes pain when air can no longer pass freely in and out of a sinus cavity. Pain when the forehead is touched. An ache in the upper teeth or jaw or a cheek that is tender to the touch. Swollen eyelids and tissues around the eyes and pain between the eyes. Loss of smell, stuffy nose and tenderness on the sides of the nose. Earaches, neck pain and a deep aching on the top of the head. There are three ways to characterize sinus attacks: acute, lasting three weeks or less; chronic, three to eight weeks and, perhaps, months or years; and recurrent, referring to several acute attacks a year. It is reasonable to conclude that you have acute sinusitis when a cold becomes worse after a week or persists for more than two weeks, especially if it is accompanied by a purulent nasal discharge that fills paper tissue after tissue. Chronic sinusitis, on the other hand, is most likely a result of an airborne allergy to substances like mold, dust and pollen that cause chronic allergic rhinitis (nasal inflammation). The treatment for sinusitis is best determined by its likely cause. With or without antibiotics, most cases of acute sinusitis clear up in two weeks. An acute attack, at the outset, is best treated symptomatically. The most important action is drinking lots and lots of liquids, which help thin secretions in the nose and sinuses and promote drainage. Hot soup and spicy foods help, as well. You can also use a saline nose spray or even a nasal saline wash (each is sold over the counter), as many times a day as needed to loosen secretions. And each is harmless. Humidifying the air also helps, as long as you prevent mold growth. The preferred method is to wet a washcloth with hot water, or heat a wet cloth in the microwave for about two minutes. Hold it over the nose and mouth and breathe the warm moist air. Another approach is to use a portable battery-operated humidifier that delivers moist air through a mask over the nose and mouth. If you use a humidifier or vaporizer, you must thoroughly clean the equipment every day and refill it each time with clean water to prevent the growth of allergenic molds. During a sinus attack, avoid alcoholic beverages, which increase nasal and sinus swelling. Flying can also make things worse. If you're using an oral or a nasal decongestant, limit treatment to three days, lest you create a rebound reaction that worsens the inflammation. If inflammation seems chronic and persists despite 10 days' antibiotic therapy, consider consulting an allergist to find the cause. While self-treatments described above can reduce symptoms, significant relief can result from the use of a prescribed nasal steroid that is inhaled. Humming can also help by increasing air flow to the sinuses, as can nasal strips that widen the nasal passages. But there is no scientific evidence - only testimonials - to support the benefit of colloidal silver nose drops. The humble sinuses, those hollow cavities hidden in the bones around the nose, usually draw little appreciation. But nothing makes one yearn for clear sinuses like sinusitis, a condition that can make the head feel as if it were filled with cement and can render every breath a struggle. For millions of people, sinusitis can drag on for months or years, unresolved by medical interventions. The focus used to be on antibiotic treatments to purge infections that most experts believed were causing chronic sinusitis. Yet many patients relapsed, leading researchers and clinicians to question their assumptions. In the last decade, a new insight has emerged. “People have taken a step back and looked at chronic sinusitis as being probably more of an inflammatory disease process,” more like asthma, said Dr. Bradley Marple, an otolaryngologist at the University of Texas Southwestern Medical Center in Dallas. “We may not be dealing with an infectious disease all the time,” he said, in which case antibiotics may not help much. Clinicians have refocused treatment on attacking the underlying inflammation of chronic sinusitis, using anti-inflammatory measures like steroid drugs. And scientists are seeking to uncover what causes the inflammation in the first place. Each year, millions of adults complain of sinusitis. Normally, the sinuses produce mucus and drain it through small openings into the nasal passages. But in rhinosinusitis, as the disorder is technically known, swelling in both the nose and sinuses blocks that drainage. The result is a stuffed-up nose and an endless outpouring of green or yellow mucus. Pain or pressure builds up around the eyes or in the face, sometimes accompanied by headaches and toothaches. For Cindy Martinez, a 43-year-old teacher in Santa Cruz, Calif., the pressure became so bad, “I just wanted to crack open my sinuses to get the stuff out, because it was pushing so hard on my face.” She battled repeated sinusitis attacks for six years. Short-term episodes of sinusitis that last up to four weeks are caused by infections and, if bacteria are involved, can be remedied with antibiotics and steroids. But the story isn’t so simple with the stubborn symptoms of chronic sinusitis, which may afflict as many as 14 percent of Americans, according to self-reported data, though some experts say these numbers are inflated. Until recently, scientists and doctors couldn’t even agree on what, exactly, chronic sinusitis is. It wasn’t until 2003 that several medical societies redefined the condition not as a single disease but as a group of disorders marked by sinus and nasal inflammation lasting at least 12 weeks. And the problem can arise from multiple causes. Predisposing factors for persistent sinus trouble are numerous, ranging from a deviated septum and bad allergies to immunodeficiency. But the underlying disease process has long been an enigma. Over the years, experts bounced from one popular theory to another that promised to explain why sinuses become chronically sick. Sinusitis is a bit of a “fad-based specialty,” Dr. James N. Palmer, director of rhinology at the University of Pennsylvania, said with a chuckle. “The fad at one point was, ‘It’s all bacterial infection.’ Then a fad was, ‘All you had to do is open up the sinuses’ ” — with surgery — “and everything would drain out.” Another hot theory blamed an allergic reaction to fungi for a majority of chronic sinusitis cases. None of those ideas proved to be the answer. A fungal allergy can be a culprit — but only in some cases. And while sinus surgery can bring significant relief by clearing out inflamed tissue and nasal polyps, which are a common source of sinus blockages, the polyps often grow back. Different research groups are now pursuing other explanations for the abnormally heightened inflammatory response that occurs in chronic sinusitis. Some are exploring weaknesses in the innate immune defenses of the sinuses and nose. Others are teasing apart the role of bacteria, which can stimulate inflammation by their presence without necessarily causing infections. Dr. Palmer and his colleagues are exploring the role of communities of bacteria called biofilms in the sinuses of chronic sinusitis patients. The investigators speculate that in some individuals, biofilms — particularly those containing the bacteria Pseudomonas aeruginosa or Staphylococcus aureus — can spur the immune system to mount an overexuberant inflammatory response that leads to sinusitis symptoms. Because the biofilm structure makes it hard for antibiotics to kill the bacteria, surgery to remove inflamed sinus tissue may ultimately be the best way to deal with the problem, Dr. Palmer said. Dr. Palmer estimates that biofilms play a role in 25 to 30 percent of chronic sinusitis cases. But the theory remains unproved, and it is possible that biofilms are just innocent bystanders. Many patients with the ailment test negative for biofilms — and some healthy people test positive. A different hypothesis, proposed by Dr. Claus Bachert, an ear, nose and throat doctor at University Hospital Ghent in Belgium, is that Staph aureus bacteria release a toxin or “superantigen” in chronic sinusitis sufferers with nasal polyps, unleashing a storm of inflammation. Such patients “really suffer much more than others,” he said. They often have recurring polyps and get severe asthma, perhaps through the same inflammatory process. In unpublished trials, his team tested experimental inflammation-fighting drugs that target the immune proteins IgE or interleukin-5 in polyp patients, with encouraging results, Dr. Bachert said. In other research, he found that doxycycline, an antibiotic that also suppresses inflammation, provided longer-lasting benefits in shrinking nasal polyps than an oral steroid did. Regardless of what may be causing chronic sinusitis, the treatment goal is controlling inflammation and helping the sinuses to drain. The most effective first-line intervention, said Dr. Palmer, is nasal irrigation using a neti pot or saline irrigation bottle, which helps flush out mucus and any inflammatory bacteria or allergens in it. “If you took all the people who say they have chronic sinusitis in the world, and you put them all on nasal saline irrigations, a big proportion would not have any symptoms anymore,” he said. Spring is here, and with it comes misery for allergy sufferers. The neti pot, a small teapot-like device used to irrigate your nose, can help you breathe easier, according to companies that sell them. Physicians say nasal irrigation is a helpful, inexpensive treatment for allergy symptoms, the common cold and many other nasal conditions, but it isn't a cure. About 50 million Americans suffer from rhinitis, a condition that includes a stuffy nose, sneezing and itchy eyes, mouth and throat, according to the American Academy of Allergy, Asthma & Immunology. It is usually caused by allergies but also can have other causes. Many people suffer chronically from nasal and sinus symptoms, including post-nasal drip, when mucus from the nose runs into the throat. The neti pot is used to cleanse mucus from the nasal passages, and may also help to rinse out allergens. You fill the pot with salt-water solution, tilt your head to one side and pour water into the top nostril. Gravity takes over and the water pours out the other nostril. "People say at first that this seems weird and disgusting," says Melissa A. Pynnonen, co-director of the Michigan Sinus Center at the University of Michigan in Ann Arbor. "But generally, if I can get adults to do it once, they don't want to stop since it treats post-nasal drip and mucus better than anything else." A neti pot, often made of plastic or ceramic, generally costs from $10 to $15. The saline solution can be purchased pre-packaged, or you can mix it at home. Dr. Pynnonen recommends using the pot twice daily, mixing eight ounces of lukewarm tap water with a quarter teaspoon of kosher salt and a quarter teaspoon of baking soda. She tells her patients to make the sound of the letter "k" to prevent the unpleasant sensation of water running into the throat. Scientific evidence supports nasal irrigation for relief of chronic nasal symptoms. The Cochrane Collaboration, in a 2007 analysis, reviewed eight papers on neti pots and other types of nasal irrigation and concluded there is evidence that it is beneficial for chronic nasal symptoms, either as a sole treatment or in conjunction with standard treatments. A 2006 study on neti pots, by researchers at the University of Wisconsin, found regular use improved quality of life for allergy sufferers. The neti pot provides at least partial relief for many people, but isn't a miracle cure, physicians say. You still need to try to avoid allergens, and you may need conventional allergy medicine for some symptoms. Also, irrigation helps dislodge mucus but it isn't known if it eases itching in the eyes, which can cause as much misery as nasal symptoms, physicians say. Also, you don't necessarily need a neti pot to irrigate your nose. Other options include a squeeze bottle, a syringe or a turkey baster, which provide more positive pressure and are likely to dislodge more mucus, physicians say. The neti pot is gentler and less likely to result in fluid traveling into the middle ear and causing temporary loss of hearing, says Bradley Marple, vice chairman of the department of otolaryngology at the University of Texas Southwestern Medical Center. FOR wits ranging from primary-school science teachers to Madison Avenue advertising teams, the phrase “the nose knows” has long proved irresistible. It might also be used to describe the unusual path taken by Dr. Ketan Mehta, a pulmonary and critical-care physician in this Sonoma County city, to entrepreneurial success. The soft-spoken Dr. Mehta and his wife, Nina, are the masterminds behind Sinus Rinse, an over-the-counter nasal irrigation product that has relieved millions of sinusitis sufferers from throbbing headaches and the nose-clogging effects of seasonal sinus infections. Since 2000, their privately owned company, NeilMed Pharmaceuticals, has evolved from a pet project into a 250-employee player in Santa Rosa’s $1.5 billion medical technology sector and a leader in the $6 billion United States market for sinus treatments. Much of this growth has come in the last two years. Although the Mehtas declined to disclose revenue figures, Dr. Mehta estimates NeilMed has tripled sales of Sinus Rinse and its other products during that time. The gains came as the company expanded from its regional base to sell its line of nasal-oriented wares nationally in supermarkets, drug store chains and big-box outlets like Wal-Mart and Costco, as well as in Europe, Australia, Canada and New Zealand. NeilMed, named after the Mehtas’ 15-year-old son, began in the 1990s as a side project to Dr. Mehta’s private practice. Dr. Mehta was suffering from sinusitis at the time, and after having sinus surgery in 1993, he set out to devise a product he could use to rinse his sinuses. In his spare time, he experimented with various prototypes. Finally, in 1999, he invested $100,000 of his own money and developed a combination that worked. What he came up with was a plastic squeeze bottle, a plastic straw and a screw-on plastic cap designed to fit against the opening of a nostril. He called it Sinus Rinse, applied for a patent and started production immediately. Sales were slow at first — mostly direct transactions conducted personally by Mrs. Mehta, the company’s chief executive, with pharmacists in Northern California and the West. At the same time, the Mehtas generated interest in the product by hawking it at allergy conferences and sending samples to allergists and ear, nose and throat doctors across the country. The strategy generated steadily rising revenues for Sinus Rinse. The company moved into a nondescript office and factory near the Charles M. Schulz Sonoma County Airport and turned its first profit in 2006. Then, in early 2005, Dr. Mehta decided to diversify the company’s product line and developed his own version of the neti pot, an age-old Indian yogic tradition for nasal irrigation. On a segment of “The Oprah Winfrey Show,” Dr. Mehmet Oz, a regular guest, extolled the virtues of nasal irrigation, hailing neti pots as the answer to just about any sinus-related ailment. Across the country, demand for these miniature tea kettles soared. NeilMed was ready and cashed in, selling tens of thousands of neti pots in a matter of weeks. “It is funny to think about, but really, without ever appearing on her show, we owe a lot to Oprah Winfrey,” said Dr. Mehta, who left India in 1981 to study medicine in the United States. Much has been written in the scientific press about the benefits of “positive pressure” nasal irrigation over the kind of “negative pressure” nasal irrigation that neti pots provide. The difference revolves around gravity. To use a neti pot, one tilts one’s head at a 90-degree angle and quite literally pours water into the nostrils, letting gravity force the water up into the sinus cavity and back again. With Sinus Rinse, however, gravity plays no part and there is no need to tilt the head. Instead, the user fills the bottle with warm distilled water, mixes in a packet of isotonic sodium solution and squirts the slightly salted water gently up one nostril until the solution drips out the other side. Then she repeats it with the other nostril. Both solutions appear to be effective. Last year, a study by researchers at the University of Michigan showed sinus patients who used a nasal rinse reported fewer symptoms than those who used over-the-counter sprays. Dr. Mehta said NeilMed sales figures suggested that customers prefer the newer technique. He noted that Sinus Rinse represented about 65 percent of NeilMed’s sales, while the company’s neti pot products represented roughly 30 percent. The remaining 5 percent includes a variety of other products such as NasaMist, an isotonic saline spray, and NasoGel, a moisturizer. Dr. Winston Vaughan, an ear, nose and throat specialist and co-director of the California Sinus Institute in Palo Alto, Calif., shares the medical community’s enthusiasm for NeilMed’s products. Unlike many others in his specialty, Dr. Vaughan said he was now likely to suggest in all but the worst cases that his sinusitis patients try nasal irrigation and some of these other remedies first, resorting to surgery only as a last resort. These products “get the junk moving and decrease the amount of mucus that can potentially serve as a source of infection or blockage.” Dr. Vaughan said, adding that because the water-based solution in Sinus Rinse contains nothing more than isotonic saline, “it does not add any medication to a patient’s treatment regimen,” so there is no need to worry about how it interacts with medication. These kinds of reviews have the Mehtas excited about the future; despite a sagging economy and a downward trend in consumer spending, Dr. Mehta said he expected growth to continue in the years ahead. Still, the nasal irrigation market is rife with competing products, including SinuCleanse from Med-Systems in Madison, Wis.; Nasopure from BeWell Health in Columbia, Mo., and SinuPulse Elite, developed in Switzerland. Dozens of manufacturers offer neti pots, as well. Anticipating expansion, Dr. Mehta is looking for a larger space in Santa Rosa to move his operation. In recent weeks, the Mehtas have also started considering the possibility of relocating the company to North Carolina, where the tax burden is lower. One aspect of operations that is unlikely to change is NeilMed’s approach to business negotiations. Unlike most pharmaceutical companies, which hire brokers as liaisons with supermarkets, drug chains and big-box stores, Mrs. Mehta still handles these negotiations herself. Though Mrs. Mehta acknowledged that she received e-mail messages and phone calls at all hours of the day and night, she said NeilMed customers had come to appreciate how hands-on and accessible she is — something larger medical technology companies simply can’t offer. Sinus infections are among the most common and aggravating medical conditions. And for most patients, treatment has long included an antibiotic. Now, medical experts are pushing for a less-aggressive approach. In the U.S., around 21% of antibiotic prescriptions for adults are for sinusitis, even though studies show the drugs often do little or no good. Short-term sinusitis can be caused by either a bacterial infection, which may respond to treatment with antibiotics, or a viral infection, which doesn't. Doctors believe the overwhelming majority of cases begin as viral infections, and less than 2% of those turn into bacterial infections. The American Academy of Otolaryngology -- Head and Neck Surgery, which represents ear, nose and throat specialists, issued new guidelines last year for treating sinusitis. Among these: Doctors generally should wait 10 days before even considering an antibiotic. If the sinus sufferer is feeling better by then, the bug is almost surely a virus, and antibiotics would be of no use. But if the problem lasts more than 10 days, chances are good it's bacterial. At this point, if the patient's illness is relatively mild, the guidelines leave it up to the doctor to decide between prescribing an antibiotic or monitoring the patient for as much as another week. Some patients, and their doctors, might not be willing to wait. Keisha Herbin Smith knew what she wanted when she called her doctor's office last month about symptoms including congestion, a headache and a runny nose. Ms. Herbin Smith, a 30-year-old research coordinator from Woodbridge, Va., asked the nurse for an antibiotic to head off a full-blown sinus infection, so it wouldn't ruin a long-planned weekend at the beach. An antibiotic "just makes you feel better sooner," says Ms. Herbin Smith, who got her prescription and enjoyed her vacation, and later went to see her doctor when she returned. Studies have shown that antibiotics may help at least some people with bacterial infections feel better faster, but not as many as might be expected. An analysis of 13 previous studies, performed for the academy to gather evidence for the new guidelines, found that 87% of sinusitis patients who took antibiotics felt better after seven to 12 days. But among patients who didn't take the drugs, 73% felt better by that point. And the drugs have drawbacks. The academy's analysis found that 25% of sinusitis patients who got antibiotics had side effect such as gastrointestinal problems, skin rashes or headaches. By contrast, among sinusitis sufferers who didn't take the drugs, 14% also had such problems. Widespread use of antibiotics is also blamed for the emergence of resistant bacteria that don't respond to traditional drugs. "Certainly, the path of least resistance is to write an antibiotic," says Bradley Marple, a professor at the University of Texas Southwestern Medical Center in Dallas and a co-author of the new guidelines. Dr. Marple says he has gotten more comfortable in recent years with treating relatively mild sinus infections without the drugs. He says he sits down to discuss options with each patient and lays out the evidence behind his advice. Other medical authorities want to go even further than the academy's guidelines to minimize the use of antibiotics in treating sinusitis. An analysis by international researchers published in the Lancet medical journal in March said the drugs "are not justified even if a patient reports symptoms for longer than seven to 10 days." That's because the way doctors typically diagnose sinusitis, based on symptoms, makes it difficult to determine which patients will benefit from antibiotics, the authors concluded. Still, habits are hard to break. Daniel Merenstein, an assistant professor at Georgetown University, knows the arguments against antibiotics as well as anyone; he's a co-author of the Lancet analysis that recommended against their use. Dr. Merenstein says he nevertheless often prescribes an antibiotic for a patient after a week of difficult sinus symptoms, rather than waiting 10 to 17 days. "I think it's a patient expectation," he says. "I'm willing to risk it and say, 'maybe you're that subset that will get better faster.' "
· A headache upon awakening. · Pain when the forehead is touched. · An ache in the upper teeth or jaw or a cheek that is tender to the touch. · Swollen eyelids and tissues around the eyes and pain between the eyes. · Loss of smell, stuffy nose and tenderness on the sides of the nose. · Earaches, neck pain and a deep aching on the top of the head.